We seem to fall in love with most of the Lenovo product lineup, and for good reasons. Lenovo is one of the most cost effective, reliable products that’s out on todays very cheaply made, disposable computer market. The G570 meets and exceeds most laptop expectations. At fist glance the newly redesigned G series laptop has a sleek new look. With a spill resistent chiclet-style keyboard, thin LED back-lit display, and grooved glossy chassis that is mostly constructed from plastics. Weighing in at only 5.73 lb with a 6-Cell Lithium-ION battery the G570 post about a 4 hour usable battery life span. This means the laptop is a semi-portable travel companion. You can defiantly take this laptop with you anywhere, just be near an available power outlet for when you need to plug in. The LED display makes colors look very sharp and deep, with a resolution running at 1366×768 which is pretty much average for a 15.6″ display. The laptop features an integrated Intel HD 3000 Graphics Chipset that is engineered for most of you entertainment purposes. Browsing HD videos, looking at Facebook, editing your families photos, and basic casual gaming are no problem for the Graphics card to handle. Multi-tasking is very efficient with the Dual Core Intel Pentium “Sandy Bridge” Processor running at 2.00GHz. The laptop also features 4GB of DDR3 RAM and a 500GB Hard Disk Drive. The G570 has a new 2.0MP webcam, Wireless N network card, integrated 10/100M Ethernet Card, and a VGA monitor output. One of my favorite features is the amount of USB ports. The G570 boasts 3 USB 2.0 ports with an E-SATA/4th USB 2.0 port. So, hooking up all of your digital media players, cameras, flash drives, printers, and whatever else you need to is not a problem. Windows 7 Home Premium 64-bit edition is the Windows flavor installed on the Lenovo. Software includes Microsoft Security Essentials, Malwarebytes anti-malware, Spybot, Adobe Reader, Mozilla Firefox, Google Chrome, Picasa, Team Viewer (remote desktop software), and many other utilities make the G570 a very capable and low maintenance machine. All Lenovo products feature a 1 year full hardware and software warranty handled locally when purchased from MDC Computers. The G570 is a perfect laptop for the casual to medium end computer user. The G570 will takle most of your work related task with ease and will allow you to simultaneously run numerous programs with little hesitation. 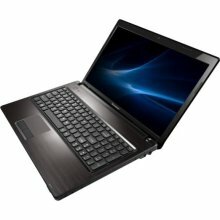 The best feature about the Lenovo G57o is the price, at only $499 the G570 is an above average laptop that is made by one of the better computer manufacturers that have some of the more reliable computers in todays market. I recommend everyone to try out a Lenovo computer. I have yet to have anyone not completely satisfied with their Lenovo computer.